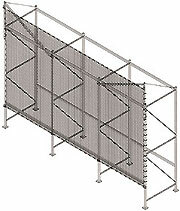 Flush Mount and Offset Mount Pallet Rack Safety Netting - Which do you need? To determine which works best for you, consider your racking load. 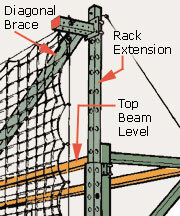 Also, consider extension mounting to increase the protection to pallets sitting on the top beam level. Flush mount hardware attaches the rack netting "flush" (in reality, up to 4" offset) on the back of the pallet rack. Utilize it when your load protrudes no more than 4" past the back of the pallet rack beam. Choose when your pallet overhangs the back of the rack by more than four inches (up to 13" max). If your pallet overhangs the back of the rack by more than four inches, utilize offset mounting to accommodate the depth of the pallet. When you need to protect pallets sitting atop the highest beam level, extensions are the answer. They can be specified in offset or flush mount configurations. Need assistance? We are always happy to help.